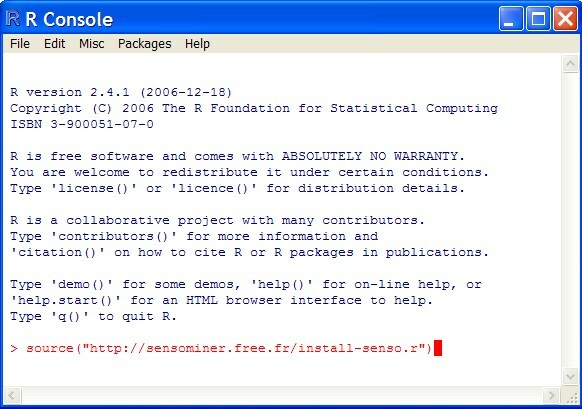 This website is dedicated to the statistical analysis of sensory data with SensoMineR and R. SensoMineR was conceived and programmed in R language; it is completely free and can be downloaded at the following address: http://cran.r-project.org (the latest version of the package is available on this website). SensoMineR collects very classic methods used when analyzing sensory data as well as methods directly conceived and developed in our laboratory. SensoMineR provides numerous graphical outputs easy to interpret, as well as syntheses of results issuing from various analysis of variance models or from various factor analysis methods accompanied with confidence ellipses. SensoMineR deals with classical profiles data as well as with more specific data such as napping data (Pagès, 2005). 11th Sensometrics: the day before We will be involved in three tutorials, "Hands on Analysis of Sensory data with SensoMineR and R", "the Ideal Profile Analysis" and "Sorting and Napping". The Ideal Profile Analysis A new version of SensoMineR is now released with the Ideal Profile Analysis methodology developed by T. Worch! SensoMineR and Excel SensoMineR can be integrated in your favourite spreadsheet application. Thanks to Erich Neuwirth who has developed Rexcel, the R software can be used via Excel. You can easily add the Rcmdr menu to your Excel menu and since SensoMineR can also be integrated in Rcmdr you will be able to use it from Excel. How to quote SensoMineR? Lê, Sébastien, Husson, François (2008). SensoMineR: a package for sensory data analysis. Journal of Sensory Studies. 23 (1). pp. 14-25. A new graphical user interface! We present an effective new approach to teaching statistics to sensory scientists from the user's perspective. Wiser for this experience, the applied mathematics department of Agrocampus Rennes has developed a software dedicated to the statistical treatment of sensory data analysis. This software comes with a graphical user interface structured according to themes such as “understanding the products' space”, “evaluating the panel's performances” and so on. Besides, each theme is also divided into part regard to a statistical approach or strategy. For example, when understanding the products' space one will first have a look at graphical tools for simple descriptive analysis, then at analysis of variance models whose outputs are summed up according to a particular layout for a better comprehension of the results, and finally at multivariate techniques such as principal component analysis. Another feature of the software is that it is under GNU General Public License that means that everyone is free to copy and redistribute it, with or without modifying it. In practical terms, students that feel sufficiently at ease with programming have a direct access to the source code and can modify at will the functions implemented in SensoMineR. This possibility allows them to develop their understanding of the statistical methods they use. After some years of using the SensoMineR package we have noticed from our students that they could better integrate the statistical methods as well as relate them to the sensory interpretations of the statistical results.